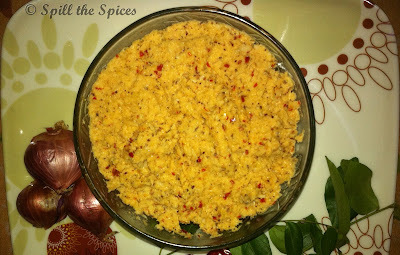 Kerala style thenga chammanthi is a dry and spicier version of coconut chutney, served usually with kanji(rice poridge), dosa/idli and rice. This chutney makes an excellent combination with rice and molagootal. 1. Heat oil. Add urad dal and red chillies. Fry till the dal turns red in color. 2. First grind coconut, small onion, red chillies, tamarind paste and salt without adding any water. 3. Now add the urad dal and pulse for a minute. Then add the curry leaves and grind for few seconds. 1. This chammanthi is on the spicier side, so add red chillies according to your spice level. 2. If urad dal is added at the beginning, it will give a paste like texture to the chammanthi. So add it add the end. 3. Try to grind without adding any water. If required, you can add 1 tbsp of water while grinding. Very similar to thogayal but without the onions. It am sure it will taste delicious with onions. Thanks for posting.